Hale Pele "Hawaiian Volcano House" was named for its gorgeous views overlooking palm-lined golf greens to distant volcanoes. 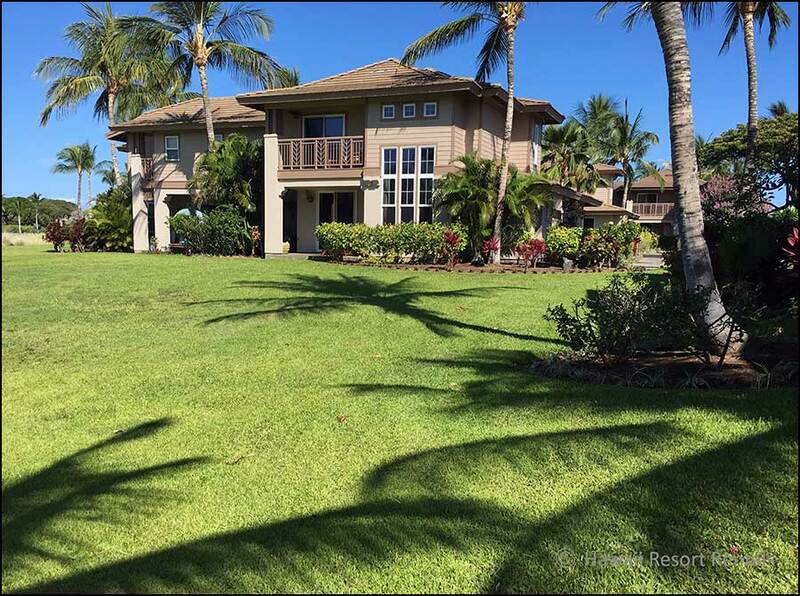 Ideally situated on Waikoloa Beach Golf Course's 10th fairway, our upscale 2 bedroom, 2 bath villa at 1598 sq ft with its lanais and garage is elegant and comfortable. It is perfect for families, couples and golf lovers, up to six guests. 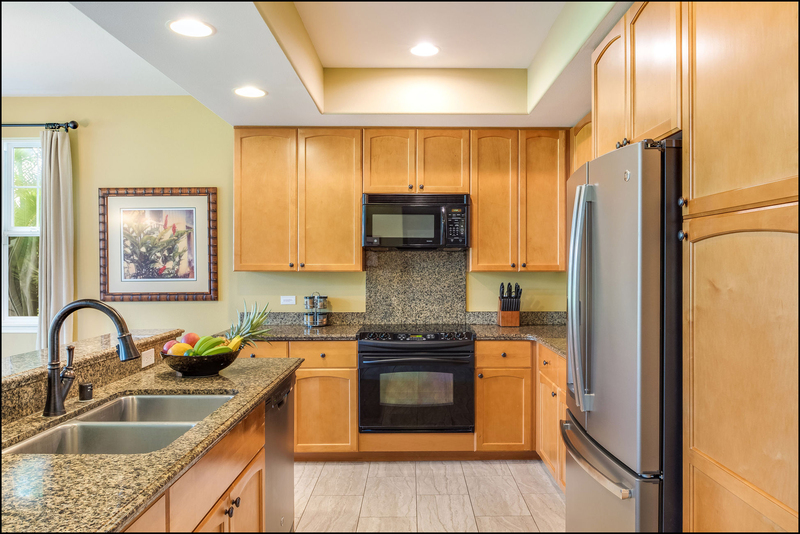 Waikoloa Colony Villas has two beautiful pools, a waterfall, spa, BBQs, gym and tennis. 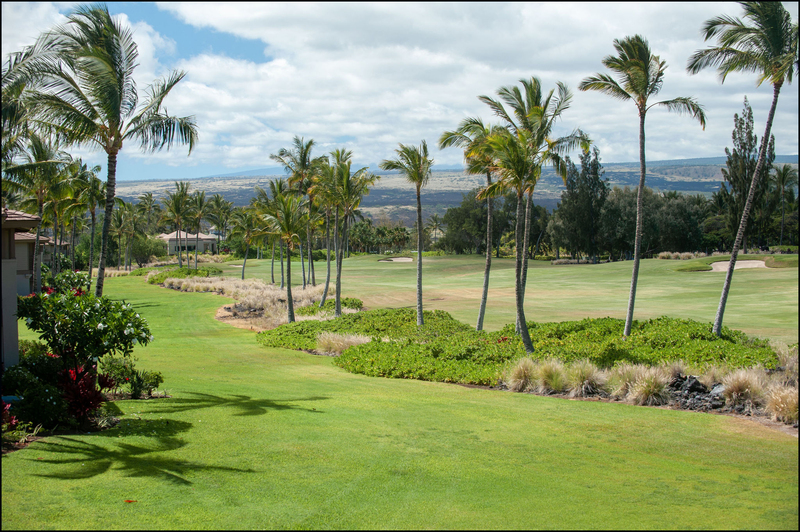 Set between two golf courses amid acres of tropical greenery, we enjoy the most privacy in exclusive Waikoloa Beach Resort. Built on a sandy, crescent-shaped beach with ancient fishponds, our resort has two expansive shopping centers with great dining and free live entertainment. 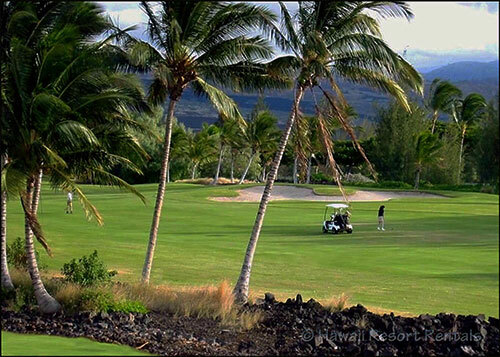 Play often with Hale Pele's Kings' Club Golf membership. It's $50 at Waikoloa Kings' Golf Course and $75 at Waikoloa Beach Course with cart and full use of the practice facility. Our unique design, windows on four sides and no one above or below, creates privacy and character. Set among fragrant flowers and palms, its soaring living room windows frame majestic views. 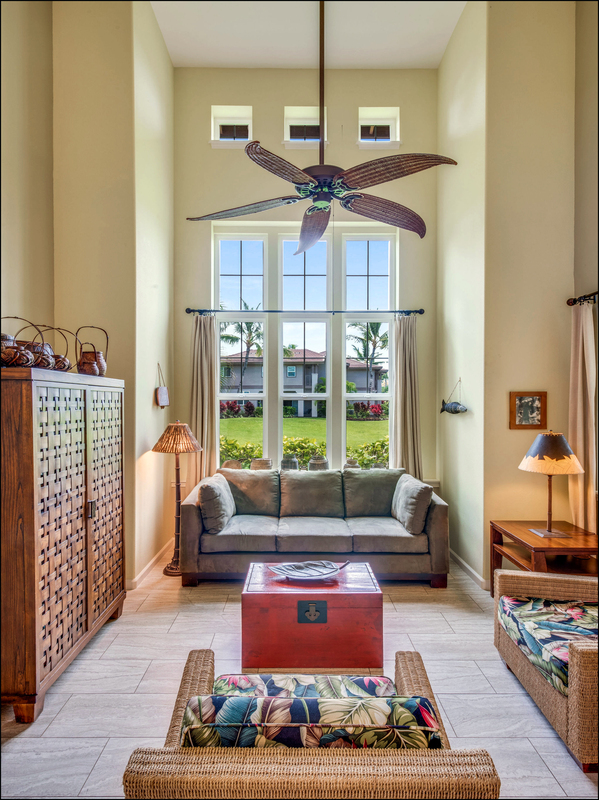 Let trade breezes and ceiling fans stir the air on those balmy 75° days or use air-conditioning. 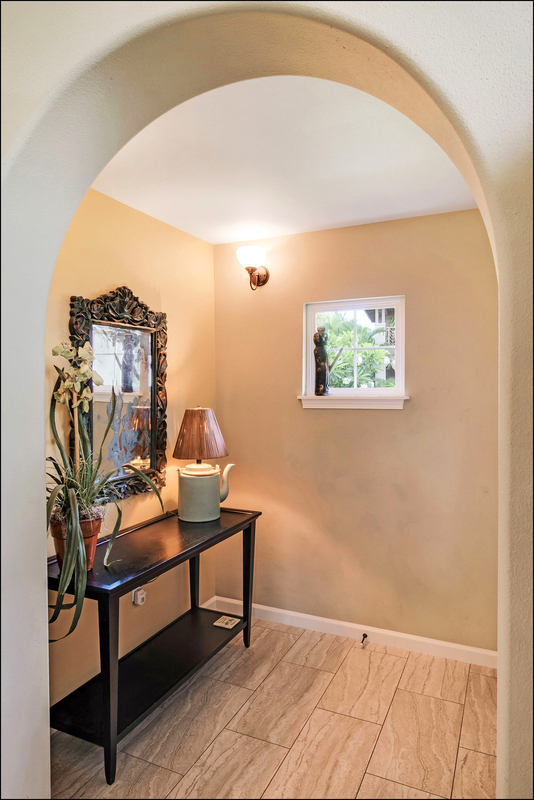 Gorgeous new tile keeps floors cool. 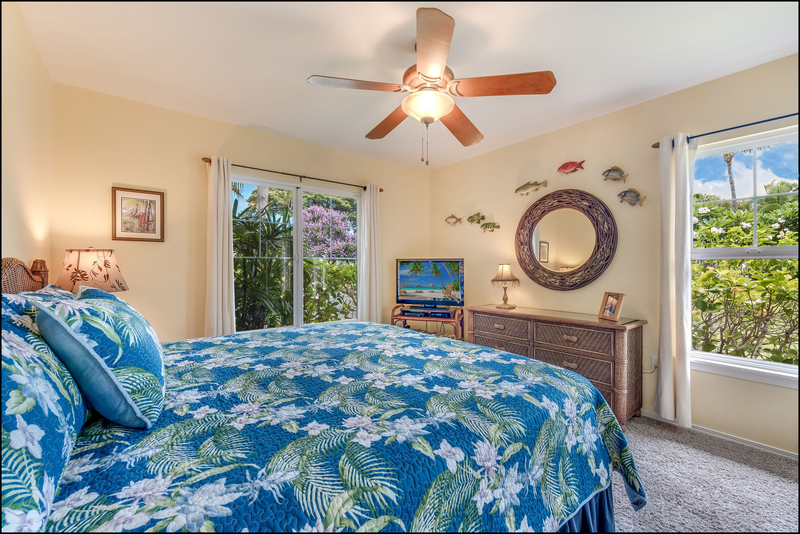 Hale Pele is furnished with the warm inviting colors of the islands, granite, marble and quality furniture. Fresh orchids and original artwork welcome you. With an airy two-story living room our villa offers a beautiful relaxing environment. Our armoire holds a TV with premium cable, DVD, CD player and secure wifi. You'll find CDs, movies and games for all ages. Grill fresh fish and enjoy tropical fruit and vegetables from local farmers markets. Or if simply brewing a cup delicious Kona coffee is your idea of vacation cooking, you'll enjoy nearby world-class restaurants. 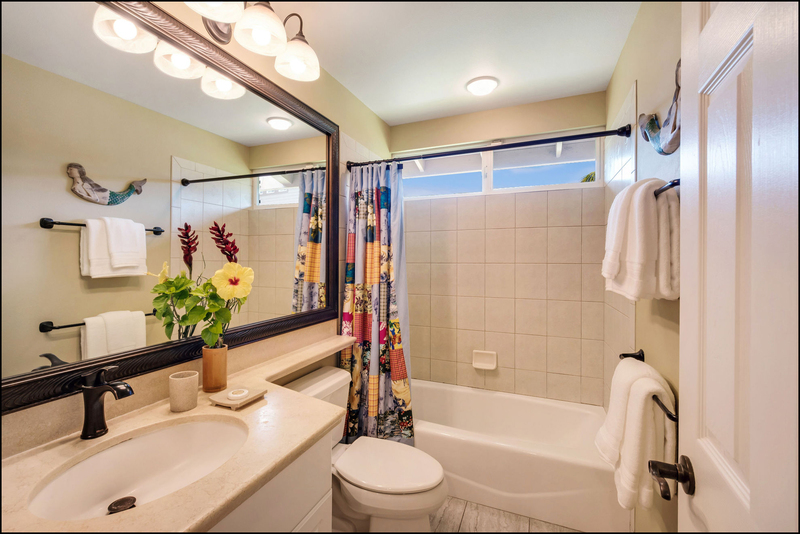 Privacy is ensured with a bedroom and bath on each level of our two-story villa. The upstairs master overlooks Waikoloa Beach Golf Course to volcanoes beyond. Handsome giant bamboo furniture includes a king bed with a pillow-top mattress. 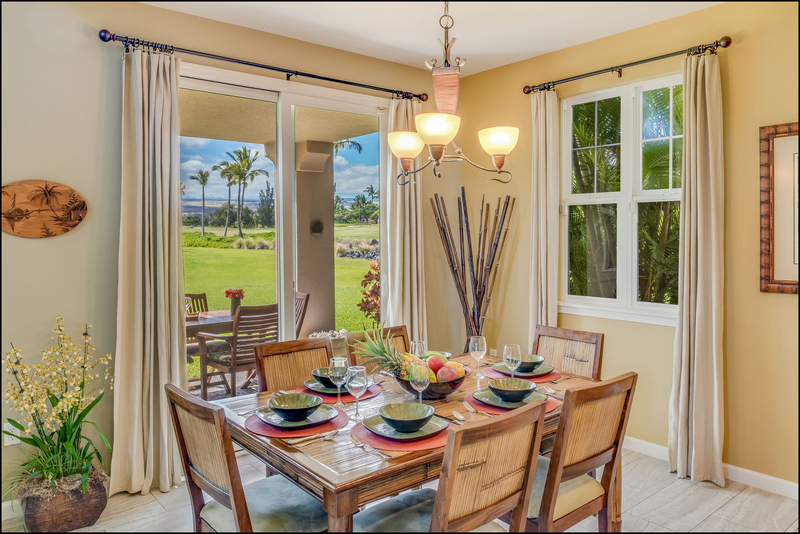 Screened windows and door may be opened at night, so you wake to native Hawaiian birds chirping. 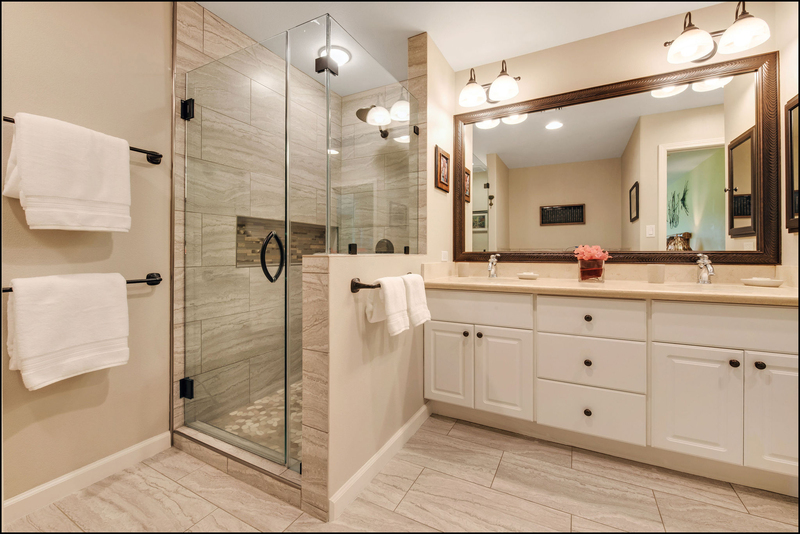 The spacious master bath was remodeled in 2018 with gorgeoous custom tile, an enlarged shower, separate soaking tub, and marble counter. 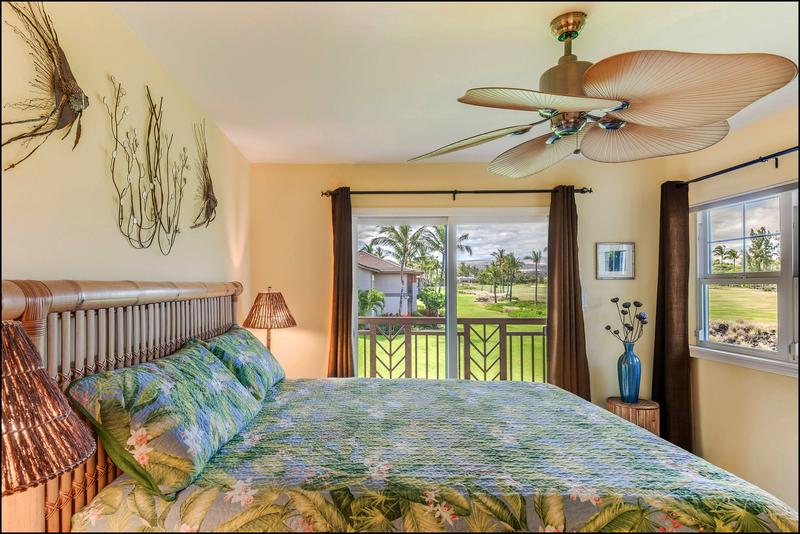 This bedroom with views of blooming Plumeria trees and gracious palms may be set up with a king bed or extra-long twins. Bedrooms have ceiling fans, TVs, DVDs and CD players. 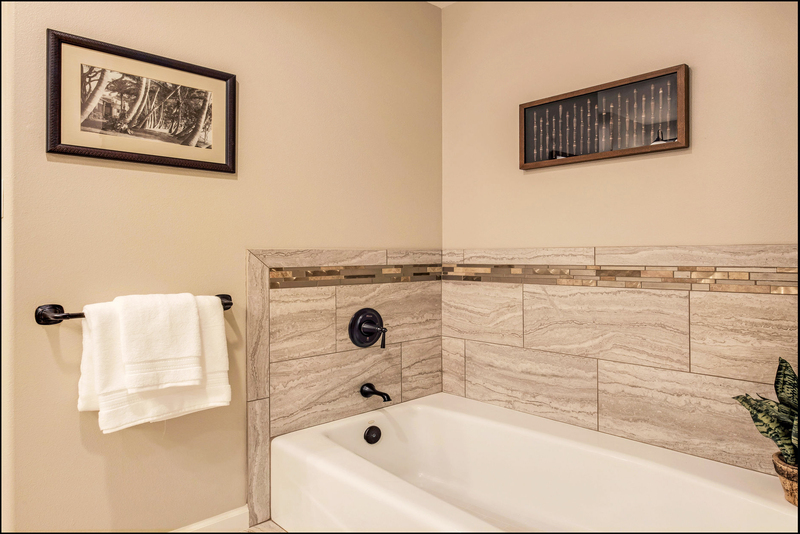 A convenient tiled bath on the main floor features a marble counter and a shower over tub. An additional child may be accommodated on with our living room sofa bed or Pack 'N Play playpen-type bed. Ask about our other baby equipment. 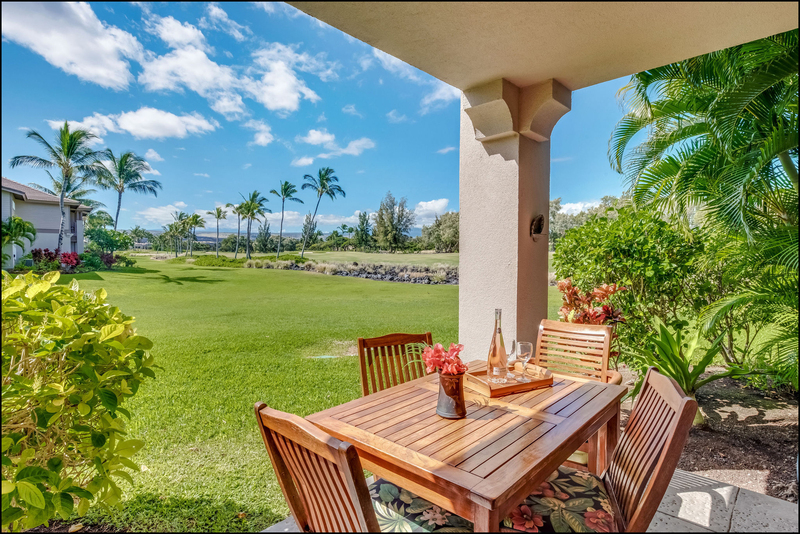 Enjoy outdoor meals or a relaxing drink with a book from our library on our East-facing lanai with teak table and chairs. It overlooks a large lawn and golf greens, safely tucked away from errant golf balls. 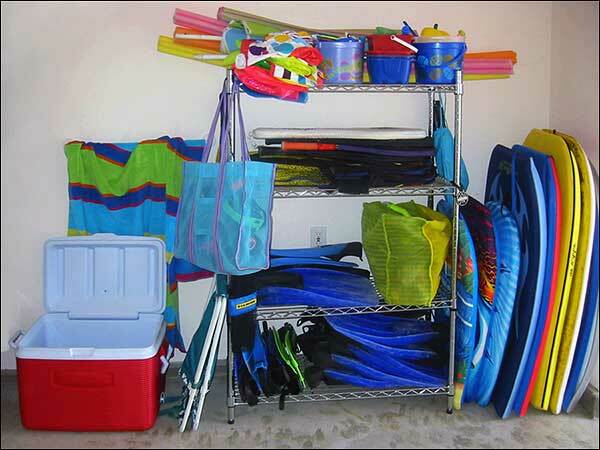 You'll feel as if you are staying at a friend's well-appointed vacation home—because you are! Create memories to last a lifetime in this magical paradise. See a slideshow of Hale Pele, our resort and the island. Choose 'full screen' for the best tour. For a carefree vacation we offer concierge service, secure wifi, TVs with premium cable, CD/DVD players, CDs, movies, phone with N American long distance, HE washer/dryer, dishwasher, microwave, ricer, coffee maker & grinder, juicer, toaster, blender, popcorn popper, spices, iron, ironing board, fine linens, beach towels, clock radio, hair dryers, toiletries, games, puzzles, books, cooler, tennis rackets, boogie boards, snorkel gear, beach toys. Park in our garage or the closest outdoor parking place. 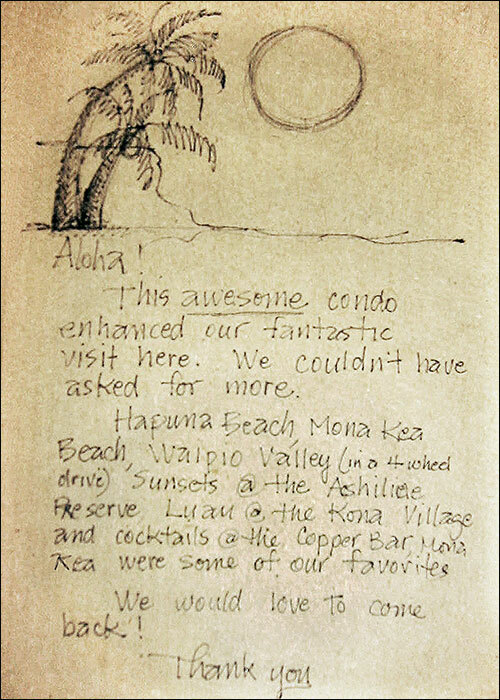 Read more guests' rave reviews and tips in Hale Pele's Guestbook.